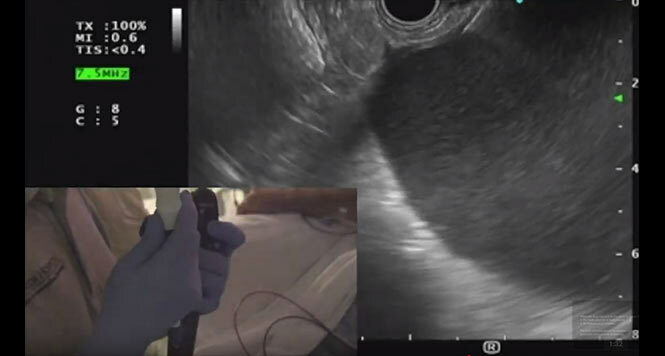 The endoscopic ultrasound (EUS) image, seen from the antrum, shows a tightly filled gallbladder with hyperechoic reflexes, in a 71-year-old patient. The patient had an inoperable carcinoma of the pancreatic head, with tumor compression of the cystic duct. Diversion of the biliary tract had previously been carried out by placing two stents in the common hepatic duct (CHD). The patient presented to the emergency department with acute upper abdominal pain and elevated infection parameters, with no signs of cholestasis. As the patient was at high surgical risk due to an inoperable carcinoma of the pancreatic head, we decided on an interdisciplinary basis to use a minimally invasive approach with endoscopic drainage of the gallbladder. Due to tumor-related anatomic changes, with displacement of the gallbladder and relative constriction in the duodenal bulb, the best way of approaching and draining the gallbladder was transgastric, from the antrum. 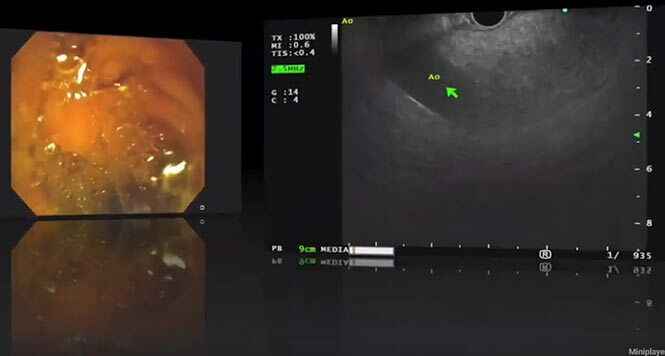 This image shows EUS puncture of the gallbladder from the antrum using a 19-G needle, with placement of a guide wire. The Hot AXIOS stent is now advanced over the guide wire and burned through the gastric wall by applying electric current. Positional control and the opening of the inner stent flange take place with endoscopic guidance alone. The outer flange is released with endoscopic visualization. Here we can see pus emptying from the gallbladder. The position of the stent in the antrum is checked using the gastroscope. The pylorus and the entrance to the duodenum are visible behind. The patient made a rapid recovery during the subsequent course, with inflammation parameters normalizing, and it was possible to discharge him after 5 days. A follow-up endoscopy with contrast administration after 4 weeks showed that the AXIOS stent was correctly positioned, with no intra-abdominal contrast leakage and with inflammation-free bile duct epithelium. During the same visit, the biliary plastic stents were also exchanged for a metal stent to provide stable palliative drainage.